This is kind of a crude subject, but restrooms are a vital part of life. Don’t worry, I’m not getting into anything too gross here, but we’ve all been there. You’re in the middle of a long drive in the middle of nowhere and ya gotta go. You drank one bottle of water too many and things are starting to get dire. I never thought I’d be blogging about bathroom experiences, but these are some worth sharing. Here are my top six bathroom stories of the trip — and we’re only halfway through. This has to be the coolest bar/restaurant I’ve ever seen. Located in Old Sacramento, Aunt Charisse said its been around forever and you can tell. The inside of the place is covered wall to wall in antique license plates, tin signs, bottle caps — really anything you can imagine. We had just finished dinner at Joe’s Crab Shack on the river, and Amanda stopped there to use the restroom. I was delayed because I couldn’t find my ID in my bag, so she went in ahead of me. I finally got inside and headed upstairs to get to the restroom, and noticed a really nice fountain on the side wall. It was right about that time Amanda burst out of the stall saying, “I think we’re in the boys bathroom!” I checked the door and sure enough right under the word “Ladies” was a hand pointing to the other bathroom. Amanda said she realized she passed a urinal on her way to the stall. We both missed reading the signs on the doors, and I didn’t realize the “fountain” was a urinal until later. Cory marvels at the endurance Amanda and I have if we can’t find satisfactory facilies. For example, we were just into Rocky Mountain National Park and we both had to go. Like 20 miles ago. We came to a rest stop on the side of the road, so happy to finally have a place to stop. While Amanda was torn between stopping to take pictures of the mountains on her way to the bathroom, I rushed in only to find to doorless stalls containing outhouse style toilets. I rushed right back out again and we ended up buying water from a lodge up the road in exchange for the use of their bathrooms. I definitly got walked in on in a bathroom in Navajo Nation. We stopped to get gas before we went to Monument Valley, and I wanted to make sure we didn’t have a repeat of the RMNP episode. The door didn’t lock, but there was a very clear sign on the door that said, “The does not lock. Knock first.” A couple of women who didn’t speak English completely missed the sign. Just my luck. We passed a last chance gas station before we got into Death Valley and didn’t bother stopping. Then we got lost for almost an hour before finally making it to Zebriskie Point. We saw bathrooms and thought we were saved. Then we got out of the car and smelled them. We bypassed. We finally made it to a cluster of stores and restaurants in Death Valley, one of the buildings being a restroom. (This was several miles past Zebriskie Point, and probably close to two hours after we passed the last chance gas station.) Amanda got into the bathroom first, taking what turned out to be the only working toilet in the four-stall facility. I went in after her, and someone in worse shape than we were came in and decided to try to flush one of the stopped up toilets, causing it to overflow. All I know is I saw dirty water coming for my feet and heard Amanda warning me to get out fast. 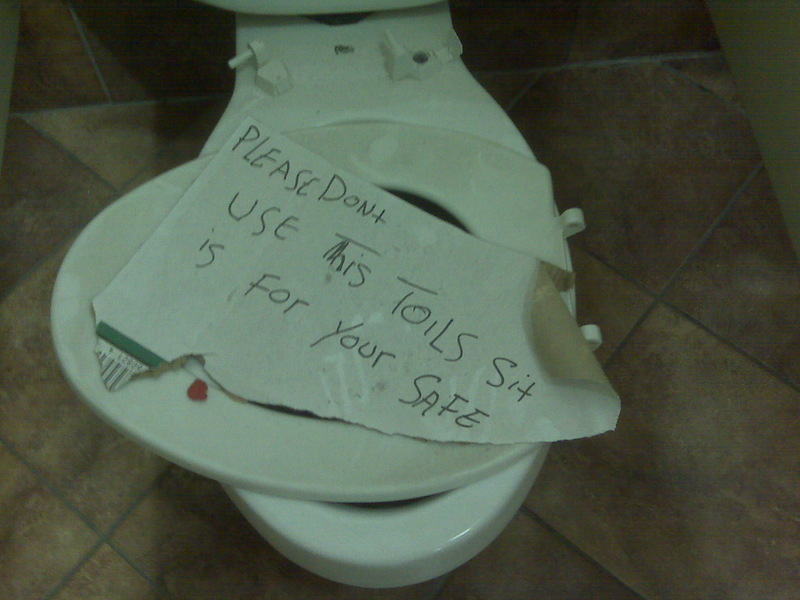 I still crack up every time I think of that toils sit. This entry was posted in Gypsy Trip, Road Trip and tagged Gypsy Trip, Road Trips by Cassie. Bookmark the permalink.